This year's winners of the Fool for Poetry Chapbook Competition had their winning manuscripts published in lavish form and launched during the Cork Poetry Festival. The chapbooks have been produced in a large format size (26cm by 20cm) using 14 point Centaur font, fully exploiting the charm of plenty of white space surrounding the poems. The covers are in full colour with French flaps. The publications are limited editions and sure to be coveted by collectors, as much as for their design as their content. The winners received 50 copies each (worth €400) and €500 in cash. 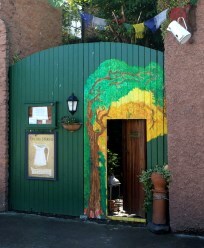 The chapbooks were launched at the Cork Poetry Festival to a capacity crowd. Over 60 copies were sold on the day. The poets were treated to hotel accommodation, drinks, meals and free entry into all events at the festival and were afforded introductions to editors, publishers and literary stars. 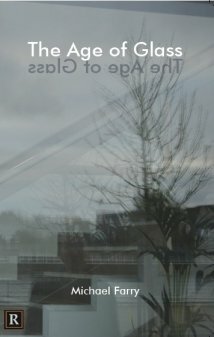 The Curative Harp is Virginia Astley's debut poetry publication. Astley is already a very successful musician, composer and recording artist having worked with many great 80s acts such as Echo and the Bunnymen, The Teardrop Explodes, The Skids and Siouxsie and the Banshees. Here she is on Youtube singing a duet with David Sylvian of Japan in a song produced by Ryuichi Sakamoto. She has been acknowledged in many single poem competitions including the Bridport. White Whale is the debut of Irish poet Victoria Kennefick, whose poems appearing in periodicals have been causing quite a stir. Her work has been acknowledged in competitions such as the Bridport and Gregory O'Donoghue Prize. The competition is open again, closing date this year is May 31st. Full details here. The winning poets will have the opportunity to launch their chapbook at the 2016 Cork International Poetry Festival, receive 50 copies of their winning publication and €500 in cash. At least one of the two winning publications will be a debut publication. Why not buy and read last year's winning chapbooks, so you can not only read great new poetry, but creatively visualise how your own poems could look next year? Doolin Writers' Weekend takes place at Hotel Doolin from the 27th - 29th March 2015. There will be readings from Donal Ryan, Christine Dwyer Hickey, Dave Lordan, workshops from Catherine Dunne, Madeleine D'Arcy, Anthony Glavin, as well as singer songwriter John Spillane, theatre with Peter Sheridan, a workshop with publishing whirlwinds Tramp Press, a photo exhibition by Hanne T. Fisker, a craft market all weekend in the Marquee and a plethora of local trad musicians, Dooliner Beer and some of North Clare's finest food to keep the whole thing moving. The prize fund for first place in each both competitions is €1000, while the winners will also receive a publishing consultation with Tramp Press (short story) and Salmon Poetry (poetry). The Poetry Competition, the closing date for which is Monday 2 March, will be judged by poet Jessie Lendennie, who is the founder and Managing Editor of Salmon Poetry. Novelist and short story writer Éilís Ní Dhuibhne is this year's Short Story judge. For terms and conditions and to download an entry form please go to the website here. Weekend Passes & Workshops can be booked with Hotel Doolin at 065-7074111 / info@hoteldoolin.ie. Cross-stream: ways of writing is a series of talks from a diverse group of outstanding contemporary poets discussing the compositional process behind one of their poems which takes place in Fingal Libraries in February and March. Produced in partnership with Fingal Libraries, these talks / presentations offer a unique opportunity for poetry audiences, writers, students and general readers to gain an insight into the range of approaches towards writing. These events are all free admission and start at 6.30pm. They will also include Q&A sessions. Poetry Ireland and Trócaire are proud to announce the launch of their fourth joint poetry competition. Applications are now invited from published and unpublished poets writing in English and Irish, as well as from spoken word poets. Extreme weather events are having a devastating effect on people in the developing world: destroying families, demolishing homes, ruining livelihoods. The people who contributed least to climate change are those most ‘feeling the heat’ from its effects. This is part of Trócaire’s ‘Climate Justice’ campaign. Cuirtear fáilte roimh iontrálacha le haghaidh an tríú comórtas bliantúil filíochta Trócaire Éigse Éireann ar an téama 'Feeling The Heat'. Entries are invited from both published and emerging poets, in English and Irish, with special categories for younger entrants and a Spoken Word category for performance poetry. Poets can submit up to THREE poems each, and entry is free. The closing date for entries is Friday 13 March 2015, and winners will be notified by Friday 8 May 2015. Entries will be judged by Mary Shine Thompson, former Dean of St. Patrick’s College, Drumcondra (Dublin City University), by poet Theo Dorgan, and by Trócaire's Trish Groves. Prizes for adults include choices such as a stay at the Tyrone Guthrie Centre in Annaghmakerrig, a year's subscription to Poetry Ireland Review, or professional feedback on your poetry through Poetry Ireland's Critical Assessment Service. Younger entrants can win a Kindle or book tokens, and a visit to your school by a writer. The winning poems are also published in booklet form, and winners and runners up are invited to read at our lunchtime awards ceremony at the National Library of Ireland in Dublin. Many past winners have gone on to read at events around Ireland, including Culture Night, and the Mountains to Sea Book Festival in Dun Laoghaire. Paddy Smith, outgoing chairperson of Boyne Writers Group, stepped down at the AGM held recently in the Castle Arch Hotel, Trim. g Home, and has taken a prominent part in the Trim Swift Festival. His final chairman’s address was a look back at his five year tenure which, he said, had been a most enjoyable time. He saluted the Group’s members for “the enthusiasm that constantly bubbles up at our meetings as members show courage and passion in presenting their material for comment by other members”. He choose as highlight of his time as chairperson, not the most important event, but one which provided a couple of lasting memories. 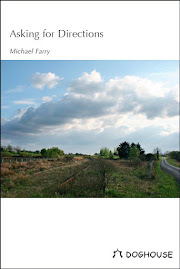 It was the Group’s celebration of the work of four Meath poets on all-Ireland Poetry Day 2013 at four locations associated with the poets. 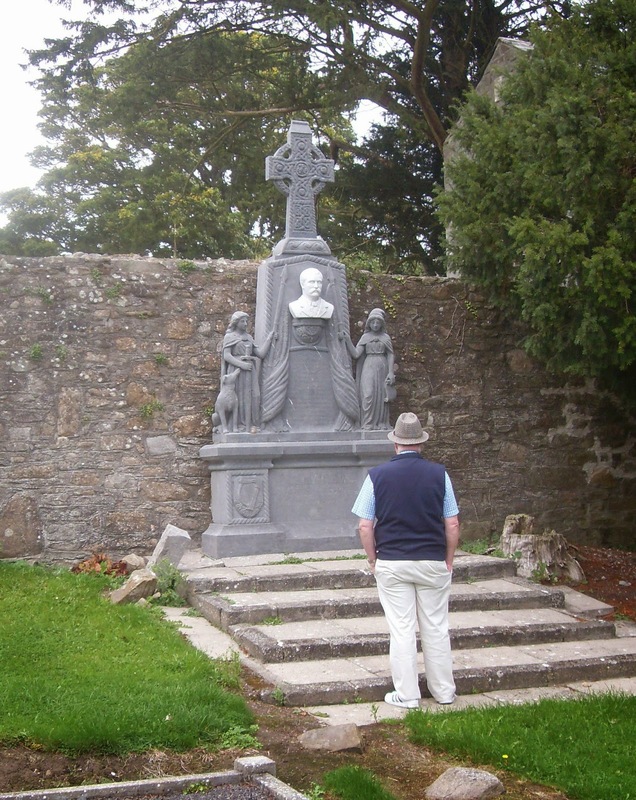 The fact that a local man, Christopher Gray of Higginsbrook House, read a poem by a famous relation of his, the poet F R Higgins, in Laracor where Higgins is buried, was a definite high point. Another on that same day was reading the poetry Of John Boyle O’Reilly in the spills of rain in a very exposed Dowth graveyard in east Meath at the memorial to the poet. The fact that it was raining so hard ‘made’ the occasion, Paddy felt, it is only right that writers should suffer for their vocation. Paddy, a noted stickler for the niceties of grammar, spelling and syntax, (an ex-journalist!) ended his address with tongue firmly in cheek as he offered his apologies to any members he may have unwittingly hurt in his zeal to improve their writing. He has no come to realize, he said, how unreasonable it was to expect that writers should know how to spell and how to use correct punctuation in their work, how to construct a sentence correctly and how to obey the rules of syntax and grammar. On behalf of the Group secretary, Michael Farry, thanked Paddy for the enthusiasm and dedication he had brought to the position and for his hard work during his five year tenure. Paddy’s successor as chairperson is long-time member, Caroline Carey Finn, a frequent contributor to Sunday Miscellany. The annual report which was presented at the meeting showed that 2014 had been a successful year for the Group with regular meetings being well attended and enjoyed, a number of new members welcomed, two issues of the Group’s journal, Boyne Berries, published, and many publication and competition successes for members. The past year saw the editorship of Boyne Berries, pass from Michael Farry, who had been editor since the beginning, to Orla Fay. Both were congratulated by members on the work they had done to make the journal an important part of the literary scene in the country. The two launches, in March and September, were very successful with contributors travelling from various parts of the country to read their contributions. 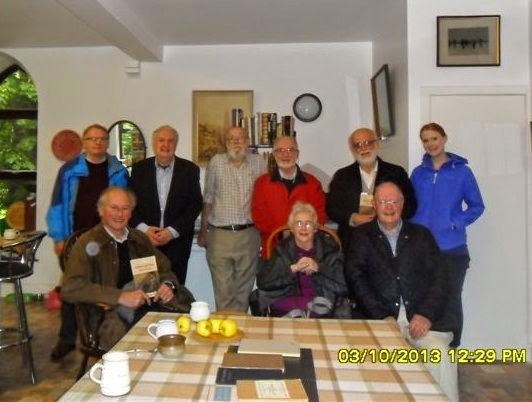 As part of the Bealtaine Festival which celebrates creativity as we age, Boyne Writers Group and Meath Writers Circle organized a very well-attended poetry reading in the Old Rectory, Trim on Thursday 22 May at the invitation of Martina Quinn of the Old Rectory. Boyne Writers Group continues to lead a weekly poetry reading for the residents of Knightsbridge Retirement Village on Wednesday afternoons. This has proven a great success with many residents taking part by reading their own favourite poetry. The secretary thanked the Castle Arch Hotel who accommodate the Group every second Thursday night and host the launches, the local press, Focus and The Meath Chronicle, who publish notices and reports of various functions. Plans for 2014 were discussed and it was decided that efforts should be made to hold a small number of readings and open mics during the year. It was also decided that the Group should mark the centenary of the 1916 Rising and it was decided that Boyne Berries for March 2016 might be a special 1916 issue with submissions invited on that theme. 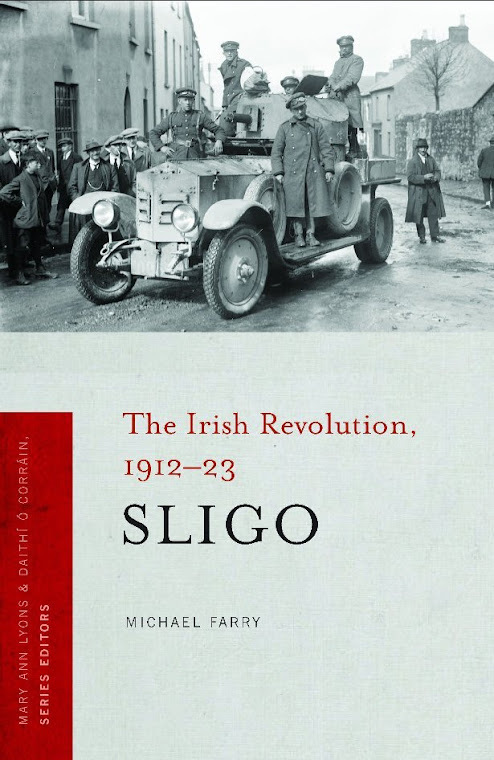 It was also decided to investigate the possibility of publishing a booklet of collaborative stories written by members based on the 1916 Rising. Following a successful pilot in 2014 in which writers Mary Russell, Iggy McGovern and Orfhlaith Foyle were the inaugural recipients, applications are now sought for the 2015 Writers' Residency in Birr, Co. Offaly. The opportunity is for professional writers who are seeking a short break from daily routines; it is for those who feel the need to re-invigorate themselves into completing current work; and it is also for writers who may simply need inspiration, through a change of place and stimuli. The bursary provides for 4 writers to receive one week's accommodation in St. Brendan House/Tin Jug Studio with breakfast each morning and two evening suppers provided. Stay: 6 nights/7 days Dates: July: Monday 6th - Sunday 12th or October: Monday 5th to Sunday 11th. Facilities: WiFi internet connections throughout, a small writing table in each of the bedrooms and an elegant drawing room with a writing desk. Herbal teas and biscuits are available in the guest area at all times. Writers may prefer to work in the studio or gallery or nearby library. The residency bursary is open to professional published writers of any genre such as literary fiction, poetry, playwrights, journalism or travel writing. There are four places available, for newly published or experienced writers. International writers may apply, and as above, their travel costs are their own. A short outline of why you would like to – or need to – spend a relaxing and inspiring week of writing in Birr. Sample copies of some published work. Final Date for Receipt of Applications: Friday 27 February 2015 at 3pm.